"In my quest to become a writer, I thought about many different topics and decided to write a story about saving planet earth. After writing several pages I found myself feeling sad and frustrated﻿. One day﻿ while showering, I fell into deep thought. God revealed that with a snap of his fingers he could save the planet. I understood he wanted me to write about saving souls and not to worry about the planet". This is a fictional story about Thomas, an average man that dies and goes to heaven. The universe has millions of stars and planets, where good souls get to spend eternity surrounded by friends and loved ones. 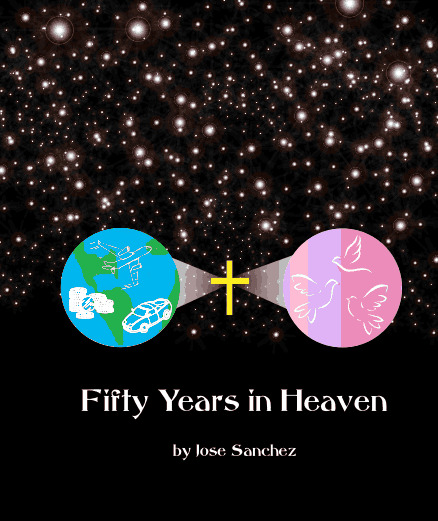 In this tale Thomas tells us what it is like to spend fifty years in heaven. This BOOK has been written to share a message of love and hope. Download a FREE copy through Smashwords. Copyright 2014 Fifty Years In Heaven. All rights reserved.